This post was written on the 23rd of January 2017, however, I wasn’t sure how Australian Ninja Warrior wanted us to handle our tributes. They’ve now graciously allowed us to talk about it publicly and I would like to take this opportunity to share the tribute events to help raise money to support his daughter Kyarna. Johann and I were in the same heat on Australian Ninja Warrior and to be brutally honest, I kinda discounted him pretty quickly. I’d seen enough episodes of American Ninja Warrior to know that the bigger, broader guys tend not to do too well on the upper body obstacles, purely because they have to lug so much more muscle-weight than us more athletically trim guys. Surprisingly though, unlike a lot of boisterous mega-beasts he was super chill and totally zen, even while everyone was freaking out about the weather and unsure if we’d get to run at all. I sat across from him in our various beanbags for hours, I was excited, nervous and pumped but he really was super relaxed and totally calm. I know people tend to exaggerate the characteristics of people when they’ve passed away, but he really was… he may have been super nervous, but you’d never guess it – and I’m pretty sure he wasn’t, he was a performer so cameras and crowds were nothing new to him. Completely surprised and impressed – those were the colours I was wearing when I watched his run from the audience, if I remember correctly, he was one of the last to go on, it might have been like 2am or something, but he just smashed it. He moved better than any big guy I’ve ever seen… so smooth and fluid. Fast forward to the Grand Final, and I was in the audience, sitting with one of Johann’s training buddies. I was talking about how he was so different to anyone I’d really met before. His buddy mentioned that Johann didn’t lift weights, he trained mainly with body weight exercises… now I was super, super intrigued. I’ve been championing body weight exercises for obstacle courses to anyone who’d listen for at least a year, and this dude was totally the poster boy for everything I’d been talking about. I’m not sure how Australian Ninja Warrior will treat Johann’s performance. It was spectacular and I hope he was proud with his efforts. His post-run interviews were humble and full of love, I really liked him. 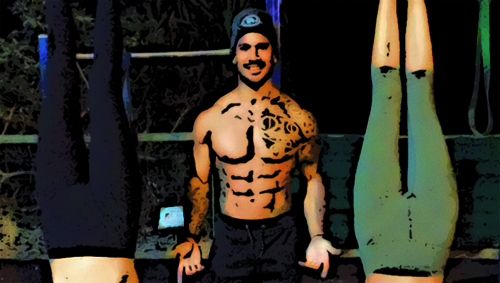 He was a big reason while I started the Ninjas In Training interview series, because I really wanted to learn more about his training techniques and how he developed his incredible physique and totally calm exterior. I honestly didn’t know him at all, I didn’t get to interview him but in the few words we shared he seemed really polite, respectful, supportive and friendly. A good dude. We both struggled with the food that catering provided, but he was way more prepared than I was. Summer sunrises! ? What an amazing morning working with @katigarnett & @jaencollective on @youfoodz New Year New You latest Summer campaign! Don’t forget to tell your loved ones how you feel, and don’t forget to take great photos with them, which is something I really don’t do enough. It’s super clichéd but life can be so crazily shocking and surprising sometimes. I’m obviously very sad and extremely shocked to get the news of his death today, no words can express the sorrow I have for his family, but I’m sure that because Johann was a really good guy, the outpouring of love and support towards his family will be absolutely immense. As an athlete, I was really excited to see how Johann’s Ninja Warrior abilities would improve over the years. He had an incredible base to work from, and while we’ll never get to see that progression, I’m so immensely grateful I got to see as much as I did. Rest In Peace Johann Ofner, you were a pretty great guy. ← Ninjas In Training : Jeff! → Bombed outta 3 Ninja Competitions – What did I learn?